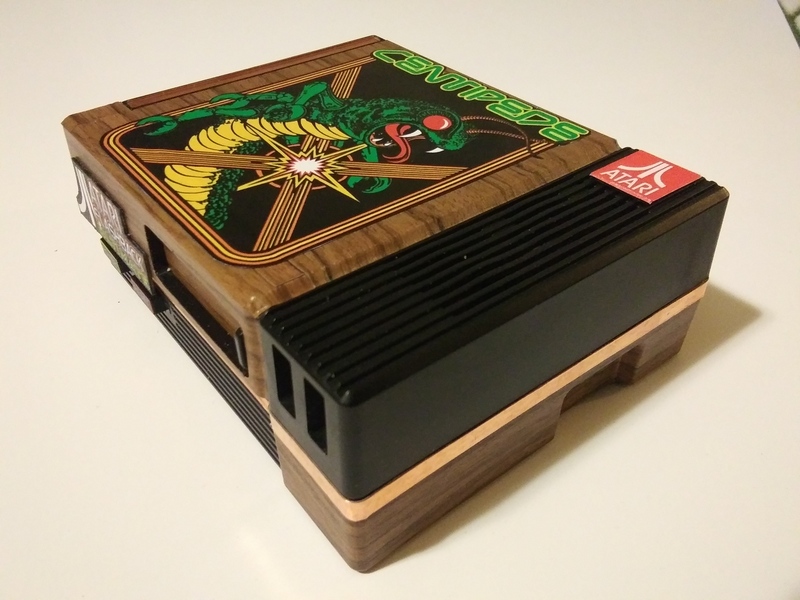 You can try AdvanceMAME, which at the moment is perhaps the best arcade solution for RPi. Not the easiest to setup though. 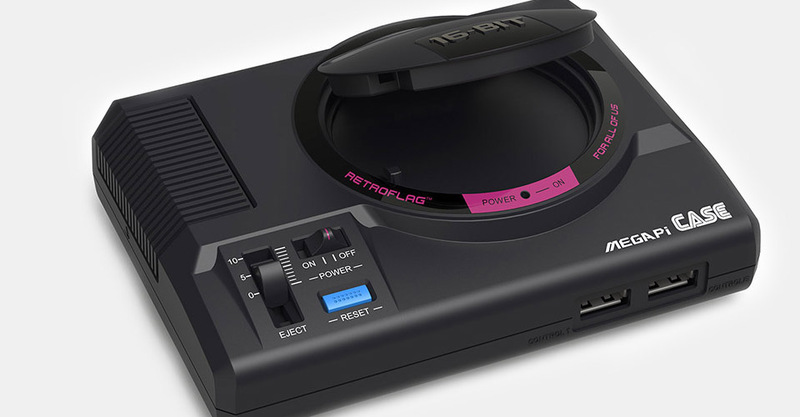 There's also Lakka/Recalbox, not arcade-dedicated frontends but an option if you really can't stand RetroPie. For those looking into "scraping" your roms for Retropie/Emulation Station, I started to use Universal XML Scraper V2 the other day. Initial opinion ... awesome!. The program runs on your PC/Lappy and you can directly link to you raspberry pi via the network. Hence, your PC scrapes the game data online, then can send it directly to the pi over your network. So easy. The 3 pic image scrapes look gr8 as well (ie screenshot, boxart, title marquee). Some good tutorials on lubetube. I did a fresh 4.4 install this weekend and decided to try UXML. Currently scraping as I type. I had Skyscraper, which did good, but for some reason it wouldn't scrape my NES or MAME sets. Muljord tried to help, but he couldn't recreate my issue. I left mine overnight, over a few days. From memory had a small error pop up, on 2 occasions, when I woke up and checked the PC. The errors stopped the scrapping. If this happens, just start the scrape again and it will remember the roms that have already been scrapped from a log file that saves. Other then that, very happy with it. Also, if you haven't, check out the options, Some good variables to adjust if you wanted. So far, I've scraped my NES, MAME, and Game Gear sets. The next big scrape will be the SNES. Also, if I add a game, will it rescrape that set, or go for the added game? 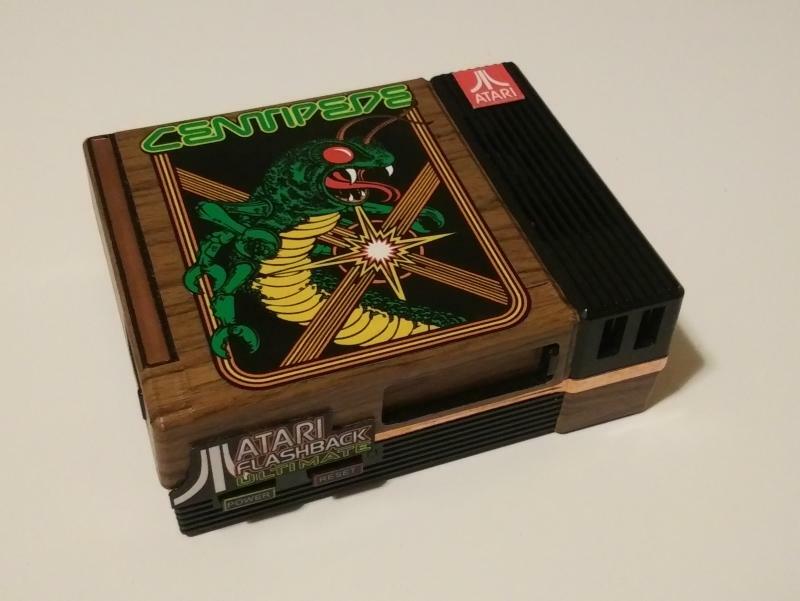 This is my Atari Flashback Ultimate, Centipede Label. I created this from customizing a Perseids Nespi case. 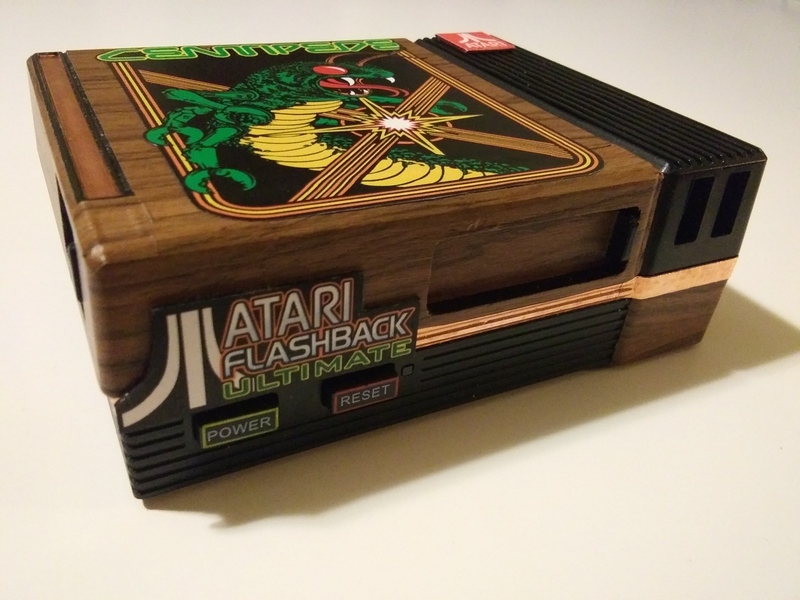 I used Vivid brand, wood grain vinyl wrap to achieve the wooden look and added some stickers and some real copper tape to accent the case. 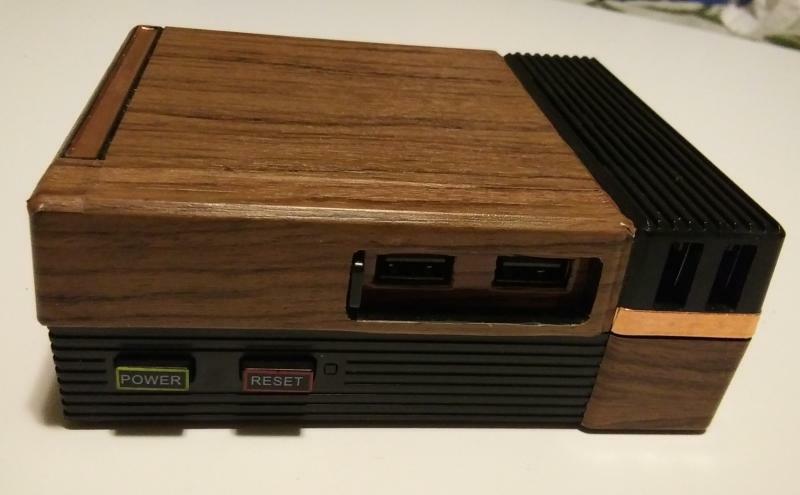 I'm thinking of adding a DB9 port (if I can find space for one), so I can use a real 2600 joystick. Duuuuude thats totally radical you Reaganite!! Edited by ClassicGMR, Mon Oct 29, 2018 3:35 PM. Thanks, here's what it looked like with only the wood grain added. 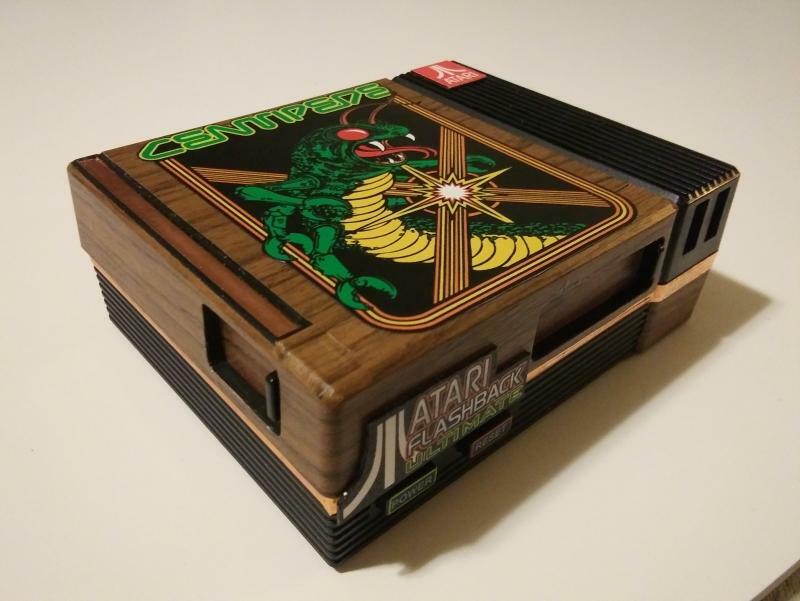 Question: If you just plan on using MAME on a Raspberry Pi, do you HAVE to use the RetroPie/Emulation Station as the front end? Is there a GUI just for MAME for the Raspberry Pi? I can't seem to find one. Mame has had it's own interface for browsing machine emulators since at least version 0.183. You can find current versions compiled for raspberry pi here. Edited by mr_me, Mon Oct 29, 2018 4:21 PM. Did you make the sliding doors yourself or was that part of the case? 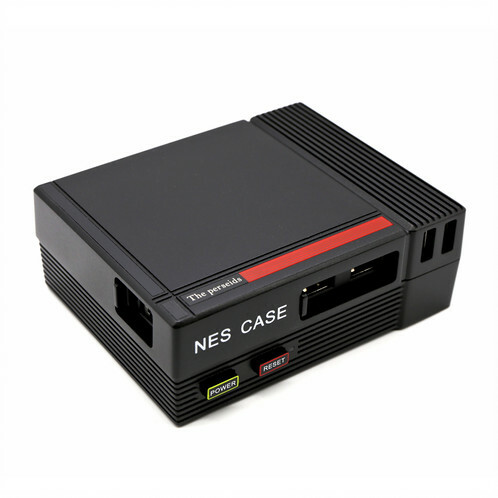 This is what the Perseids NES case normally looks like. They have a built in usb sliding door. The scrapper will check your current set from the beginning. If the rom data has already been downloaded, it will skip to the next rom and check. It probably cycles through the roms at 1 sec per rom or so (if the rom data has already been downloaded). If it gets to a new rom, it should download the data just for that rom then conintue its cycle check. Maybe a few minutes on a large rom collection. So I took my Super Kuma 9000 Pi setup on vacation with me. It's been a great travel solution for gaming and I would highly recommend it. 2nd stupid thing: I have nothing at all to connect to the USB and set up controllers with. I have a Bluetooth keyboard and 2 Bluetooth controllers. Although I have the backup for the setup it doesn't save the control settings. I need something wired to set the controls back up with. No dice. Bottom line: I played one game for the entire week on my Pi setup. Moral of the story is - kids... don't go anywhere without at least one wired controller. 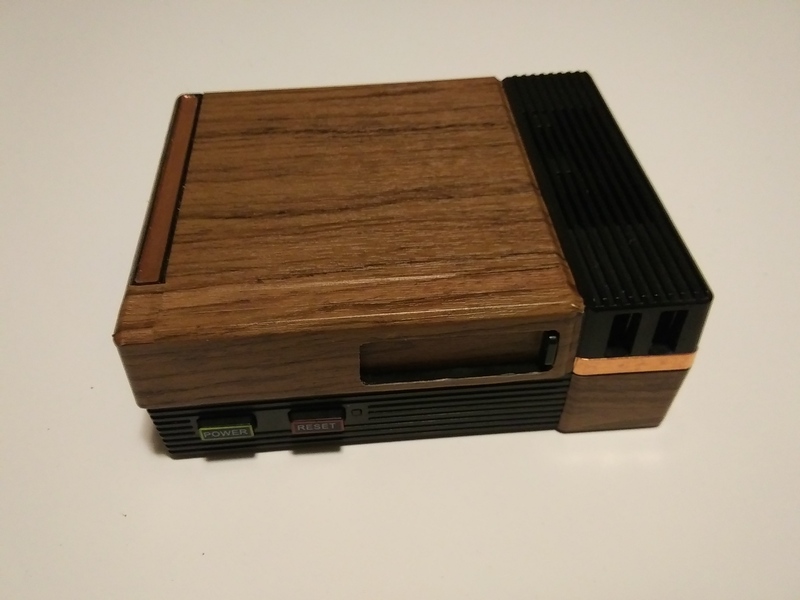 see how my nephews take to it in order to decide if Retropie setups would make good Xmas gifts or not. They played a little bit when I first set it up, but that was it. Will be looking for something else for them for Xmas. This is what I'm concerned with regarding my joystick project. Will my kids actually want to play arcade games or is this just a "flash in the pan" and they'll play it a couple times then that's it? They already forgot I'm working on it. I've got another coat of paint or so to put on the top panel before I put things together and "prototype" it with the kids. It'll be interesting to see how well this goes. Well, it ain't fancy but the stick works! Wired and documented it then set it up on Emulation Station on my Linux Mint laptop. I left the bottom part bare wood for now. I drilled a hole in that slanted side to bring the USB cable through. The stick handles well. I played DK 3 and got around 98K for a score. Now I'll turn my kids loose on it to see what they think. What did you use for parts? Sanwa? Knock-off? I plan on doing a zero delay usb joystick with some nice knock-off sets I've seen. Good reviews too. Edited by ClassicGMR, Tue Nov 6, 2018 8:53 AM. I used a kit called XCSource USB Zero Delay Arcade kit. They are "clicky" but it was easy to put together. The wire harnesses snap onto the leads of the buttons, which is nice. The buttons are shallow, though, so the best fit is on a 1/4" thick board, like MDF. Lesson learned last night: my button config is all messed up. I couldn't start games, nor exit them, despite correct setup in EmulationStation. I'm going to move the 1p start, 2p start & coin buttons to JUST controller one, instead of splitting them. Player 2's button hookups will be strictly non-meta buttons(coin, etc). In MAME, it kept thinking the 1p start and 2p start were the same, as they were on different controllers. Lesson learned. Also another lesson learned: I can't use 2 pin female jumpers(extracted from a computer) in the DragonRise boards. They fall out too easily. Edited by ClassicGMR, Wed Nov 14, 2018 9:35 AM. Note that the volume slider says EJECT -- that's how you flip the lid open. Why does the lid flip open? There's a little space in there for storing extra MicroSD cards. The ribbed side flips open for access to the card slot. 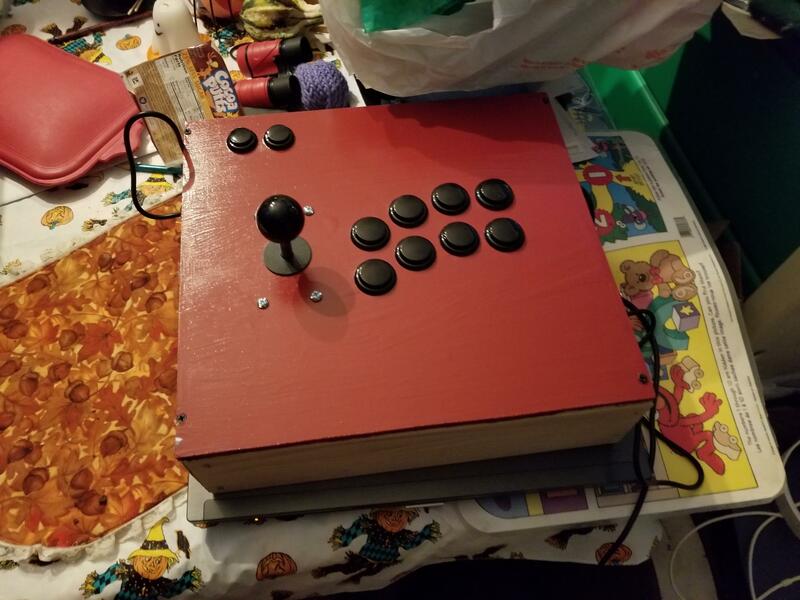 I made some progress on my RetroPie arcade cabinet. First off, player 1's controls now has all the meta buttons(p1, p2, coin). That works great...almost. I did a controller re-define in emulation station. I still had to go into mame and re-define everything as it was mis-configured before. I can coin-up a game & play. However, I can't exit it. Also, when I re-defined the buttons in emulationstation, it says it's controller 4. How do I flush out all the controller definitions & start over? I'm thinking my Pi thinks I have 4 controllers. Add $3 and get a fan and heatsinks. Good point. If someone is going to the trouble of scripting the button presses, might as well make it a little safer. I'm not sure how mame numbers the controllers but I can tell you windows does it differently than linux. Linux does it by order of usb ports so it can change if you use different usb ports. Windows does it by order first attached so it doesn't matter what usb port is used. I would think if there is only one controller attached mame would number it as the first. Since stable controller numbers in mame has been an issue, they added a mapdevice element to the controller configuration. I think this was introduced in mame 0.178. I just realised that you were asking about emulationstation. There is a file called "es_input.cfg"; delete this file and emulationstation starts over with controllers. The official way in retropie; Retropie Setup Script >> Manage Packages >> Manage Core Packages >> EmulationStation >> Configuration / Options >> Clear / Reset EmulationStation Input Configuration. To remap "exit" in mame; hit tab for the menu, "input (general)", "User Interface", "UI Cancel"
Edited by mr_me, Wed Nov 14, 2018 2:30 PM.